The highest quality in cover slip coating. Experience the difference in your cell cultures with these state-of-the-art German cover slips featuring a digital bio-coating system. These full coverage, pre-coated cover slips are for use with all sizes and substrates. Many researchers prefer these cover slips for their excellent consistancy, coating control and cell culture performance. Some international training schools chose Rat Tail Type I Collagen Coated German Glasss Coverslips as required material for their students. 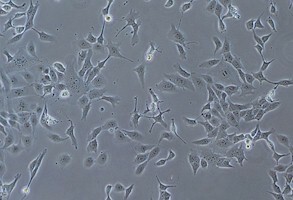 Since then, Cell Culture Control was created for researchers to normalize their cell culture data and improve their culture quality, or to trouble-shoot their cell culture problems. Cells attach to a coated coverslip. The small 12mm coverslip occupied only half of a culture well. 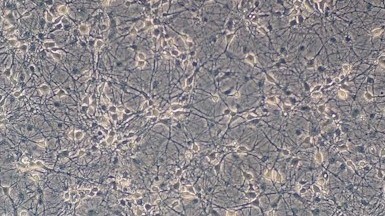 In the same well, cells attach to the other half of the same culture on the non-coated half of the cover slip culture well. 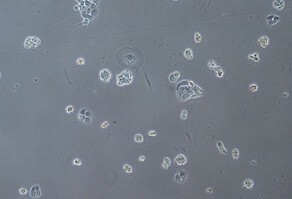 38 hours in culture, cells on the upper left image show rapid, healthy growth. Cells on the plastic culture well (right image) were struggling.